They say that you can have too much of a good thing. Pah! I don’t believe that at all. Good things are good things are good things. Especially when it comes to Tarot decks. 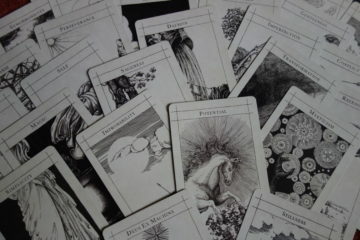 Especially when it comes to THIS particular Tarot deck! Alexander Daniloff’s 2012 Tarot has now reached its third incarnation and I am now proudly clutching a copy of that 3rd Edition to my ample and heaving bosom. This third edition has several changes, so buckle up baby, we’re going in! The first thing to notice is the new SIZE of the cards. 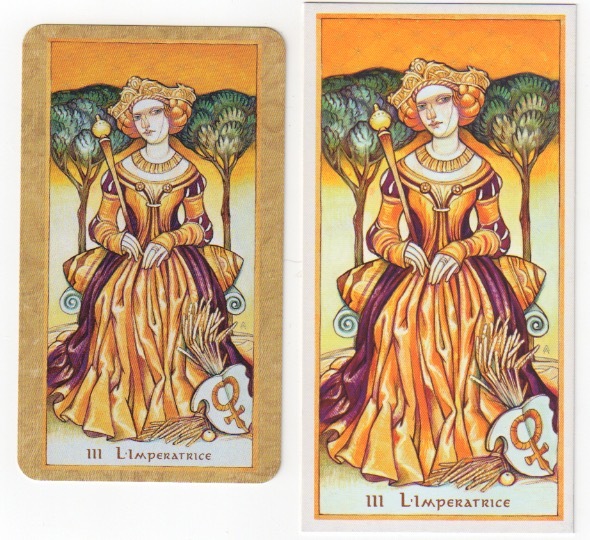 The first two editions were substantially taller than a standard sized tarot. This edition pulls everything into a standard RWS-sized deck, with no cropping of the image nor significant colour alteration. The next point to note is the corners – there are rounded corners! This pleases me enormously as I am forever worrying about clients dunting the corners of my other two Daniloffs in an over enthusiastic shuffle and thus rarely take them out of the house in case they get damaged. The cards now have a border, a nice shade of gold. 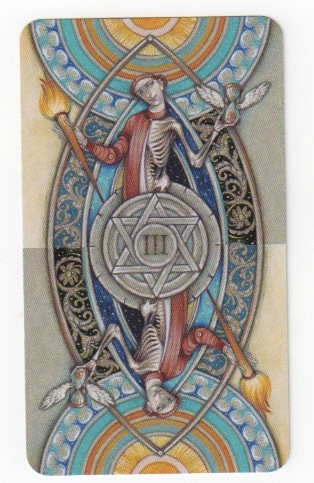 This border replaces the white border in the Major Arcana cards and most of the Minor Arcana, with the exception of the four Aces and the 16 court cards. 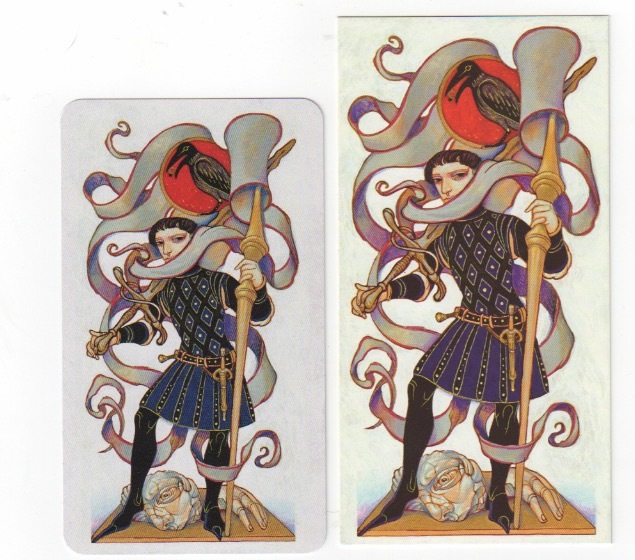 The original design of the court cards in Alexander’s deck did not include a border and I think that the decision to leave them with their original white backgrounds is the right one to have made. To sit these characters into the new golden frame would have detracted from their impact. Leaving the Aces unbordered was prompted by a similar concern about the aesthetics of these four cards. I like them unbordered, but it might not be to everyone’s tastes! See? Version 3 also has a new card back! The design, a figure who holds a blazing torch in his right hand, whose left side is skeletal and reminds us of the passing of time. 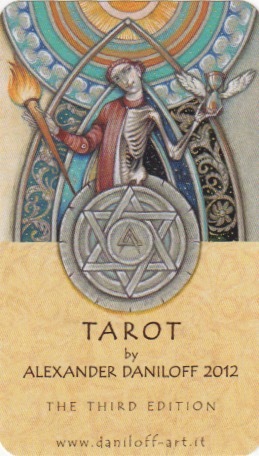 In the centre of the card is a six-pointed star with III emblazoned – the 3rd version of the deck. The image is double ended, so perfect for using with reversals. The card stock itself is well-suited to shuffling and gaming, so no complaints from me on that front, I like the satin sheen on the new edition. 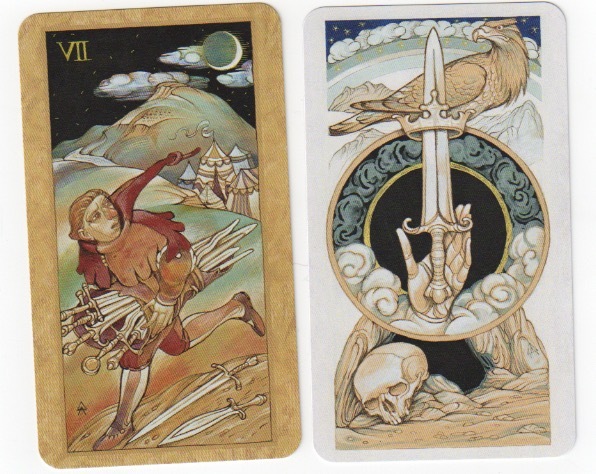 In this 3rd Edition, Alexander has kept Strength as Major Arcana VIII and Justice now resides at XI. In the previous two editions, there were an additional pair of Strength and Justice cards, so that you could use the numbering system that you preferred. Which was a lovely touch. The change here is, I think, due to cost/printing restraints. I am comfortable with Strength as VIII, so this change doesn’t present any problems for me. Alexander’s decks have always carried a Quintessence card. In the two previous editions, this was depicted as a white curtain that we could not see through or behind. 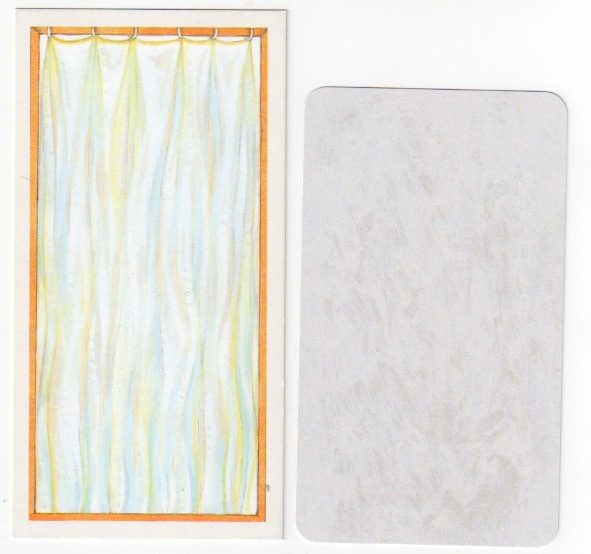 In the 3rd Edition, the Quintessences is presented as an almost blank card (there is some texture on the card) and if you weren’t aware of the original Quintessence card, you might just consign this ‘blank’ to the tuck box, along with the deck’s frontispiece. Quintessence. Also, aren’t my scanning skills dreadfully wobbly?! In summary then – if you are looking for a gorgeously coloured, RWS-inspired Tarot that is easy to handle, and something that you aren’t going to see on Amazon, this is the version to buy! You can buy it here! Or, if you are a TABI member, you may still be in time to buy one from our recent group order! I used a corner rounder on mine. I would have liked to remove the borders, but it wouldn't have worked well on this deck due to the borderless cards and the art on the backs. I may have to get the 3rd edition because of the smaller size and the new borders appear to complement the artwork nicely. Thank you for the lovely review! Yes, he is very much inspired by Italy's Renaissance/Medieval past. Love the Alice in Wonderland idea! Please ask me any questions that you might have if you are still in two minds about what to do.